Sandy Zielinski, New England Cooks Co-Host. My recent trip to Charleston, South Carolina has given me a whole new appreciation for grits. The fact that these can be made a day ahead of time and are often a new addition to your menu, makes this a winning recipe. Bring water to a boil in medium saucepan over high heat. Add grits and 1 teaspoon of salt. Turn heat to medium-low and cook, stirring occasionally, until grits are thickened and tender, about 5 minutes. Let the grits stand for 5 minutes. Meanwhile, whisk together half-and-half, mustard, pepper, eggs, egg yolk, and the remaining 1 teaspoon salt. Stir in grits and cheese until cheese is melted. 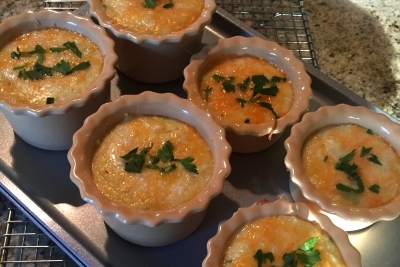 Preheat oven to 350 degrees F. Uncover ramekins and place on a baking sheet. Let stand at room temperature while oven preheats. Bake until puffed and edges are set, about 40 minutes. Sprinkle with chives or parsley, and serve.